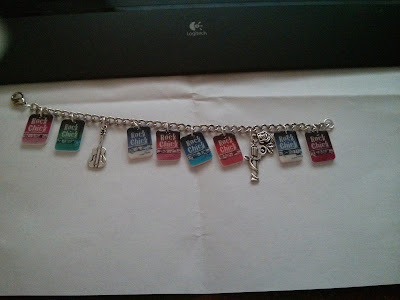 B's Beauty and Books: My Kristen Ashley Rock Chick Series Cover Bracelet!!! My Kristen Ashley Rock Chick Series Cover Bracelet!!! I asked for a custom made bracelet that had all the cover art for each of the Rock Chick books by Kristen Ashley. Oh Whimsical Me came up with the above bracelet and today I got it! I LOVE IT! The picture below is the one I took. It bypassed all my expectations! I highly suggest you go and get your favorite book made into a bracelet. Thank you Nadine! I LOVE IT! :D I'm just now seeing this. Thank you so much! I'm glad you like it. It really is beautiful and so many people have complimented me on it. I send everyone I know to your page! =) Hopefully that will translate to lots of bracelets being made! Thank you again!